Aldorico "Chuck" Collina, 63, of Granite City, Ill., formerly of Martins Creek and Easton, died Wednesday, Sept. 25, 2002, in St. Claire's Hospital, Alton, Ill.
Born: Oct. 13, 1938, in Martins Creek, a son of the late Frank and Philomena DiMarcantonio Collina. 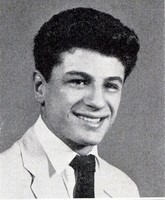 Personal: He was a 1956 graduate of easton High School, where he was on the wrestling team. He was an electrican, working out of union hall Local 234, Castroville, Calif., and Local 1340, Newport News, Va. Membership:He was of the Catholic faith. Survivers: a son, Nicholas of Newport News, Va., two daughters, Lori Leib and Gina Curtis, of Newport News; two brothers, Elmer of Louisville, Ky., and Nido of Easton; four sisters, Narina Scheerbaum of Wind Gap, Mary Miller of Zepher Hills, Fl., josephine raulston of Ridgelans, Miss., and Mafalda Schmuelgen of West Chester, Ill.; and three grandchildren. Three brothers, Frank DiGiacomo, Anthony and Aldorico Collina, all died earlier. Services: 11 a.m. Tuesday in the James J. Palmeri Funeral Home Rt. 611 and Alpha Ave., Martins Creek. Friends may call from 7 to 8:30 p.m. Monday. Burial in Church Hill Cemetery. Memorials: to St. Jane's Catholic Church building fund, Easton.